Get your Wicked on Broadway tickets before you travel to New York. It’s easy to buy your theatre tickets online, saving you time and money. 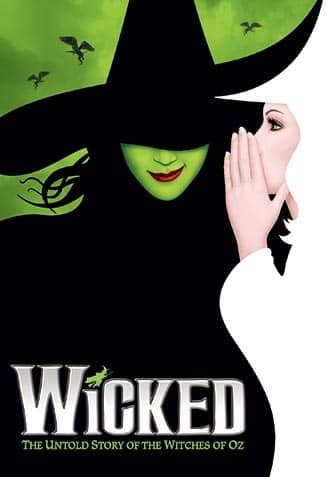 Wicked the musical on Broadway is a beloved show that has broken box office records and won many awards. 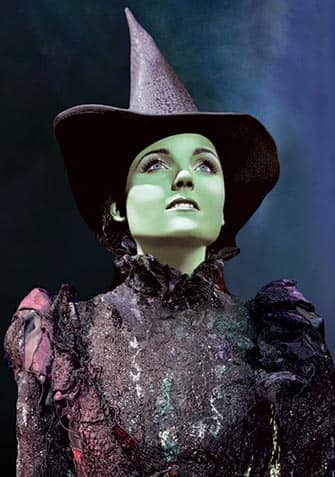 It’s performed in the Gershwin Theatre and portrays how the Wicked Witch of the West became, well, wicked. As it turns out, she wasn’t always wicked! 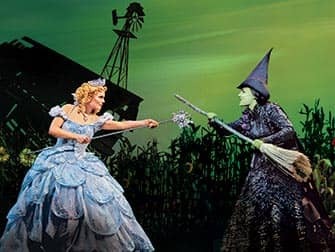 The songs are catchy and for most of the musical you’ll probably be rooting for both the “Good Witch” and the “Wicked Witch” as they are both endearing in one way or another. I definitely recommend going to Wicked or one of the many Broadway shows when in New York as they are highly entertaining! The musical is a both a prequel and a sequel to The Wizard of Oz which means that it starts off before Dorothy dropped in and continues on after her arrival. Dorothy herself, however, is only but a silhouette in the musical, referenced by her ruby slippers … which she apparently stole. Instead, the main characters of the show are Glinda and Elphaba who major in sorcery at Shiz University. Glinda is a self-absorbed popular blonde while Elphaba is an intelligent outcast who seems to look a little different than the others. Despite their differences (and initial loathing!) Glinda and Elphaba become roommates and then good friends. The musical tracks the toils and troubles of their friendship – including falling in love with the same guy! But is this what transforms Elphaba into the Wicked Witch of the West? As much as the story has going for it, it’s not the only reason why Wicked is popular. When Glinda sings about how it’s shrewd to be “Popular” the lyrics and melody make you want to sing along. And, luckily, there are more songs like that! 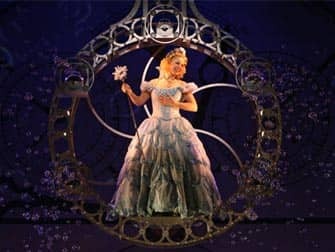 The costumes too are truly spectacular, it’s no wonder then that the musical won a Tony Award in 2004 for best costume design. Together with the set design this is something that truly brings the land of Oz, and more importantly the Emerald City, to life. Flying monkeys included. How to buy Tickets for Wicked? It is easy to buy tickets for Wicked with the link below. I recommend buying tickets online before your trip to New York. Why? The website below guarantees great seating in Orchestra or Front Mezzanine for discounted prices. You will save time and money and most importantly you don’t have to stress about finding tickets when you are in New York. A lot of Broadway musicals are very popular and are often sold out. Send me an email at eric@newyork.com.au if you want to book for groups of 15 people or more. Eric’s Tip: The musical is based in the wonderful land of Oz, where animals can talk and magic can be learned.The show references a lot of the Wizard of Oz and if you’ve read the book or seen the movie then this musical will make a lot more sense to you. This is also the reason why I would not recommend the show to young children under the age of 8. Not only for that reason but there is a bit of violence and strong language. Wicked is a little bit of a girly musical, with themes such as makeovers, popularity, boys, so be sure to bring your teenage daughter! Don’t want to see Wicked?